I love the recent resurgence of space movies. To me, it’s a sign that we are regaining a societal urge to explore the stars once again. Could this reflect a renewed dissatisfaction with Earthly events? Perhaps. Passengers did not initially demand my visit to the theater. Honestly, I like Jennifer Lawrence, but she’s not “must-see” in my world. The same can be said for Chris Pratt. Both are immensely likable and charismatic, but both are also super-hot in Hollywood right now, which led me to believe Passengers could be nothing more than a vehicle for their stardom. I did not expect an actual story with real weight. The premise is a rather simple one. The Avalon is a star cruiser traveling 120 years to a distant colony planet founded by a mega-corporation. 5,000 passengers are on board, but they are in hibernation for nearly the entire journey, as are the 200+ crew members. In fact, the passengers are not due to awake until 4 months before arrival. Everyone they knew back on Earth will be long dead by the time they start their new lives. Unfortunately, Chris Pratt’s character wakes up 90 years too soon due to a glitch in the system. He is literally the only living person aboard the ship until … he isn’t. That’s when Jennifer Lawrence’s character comes into play. The story is a little bit of a romance, a little bit of a mystery, and a little bit of a thriller all wrapped up under the guise of science fiction. There are also deeply complicated morality issues present in the story, which I definitely didn’t expect. In fact, I think it was brilliant to cast such likable actors in roles that, at times, prove morally troubled, yet are always sympathetic. Truthfully, this is one of those movies that inspires the viewer to start asking, “What would I do in that situation?” “Would I really be any different?” I appreciate films that subtly demand introspection. So, yes, Passengers definitely had far more story than I anticipated, and that really delighted me. Even better? It’s a good story. It’s a story that is easy to invest in. These are characters who are easy to invest in. There are questions of cause and effect, actions and consequences, internal versus external motivations, and morality that add a wonderful layer of depth. And, as you would expect, there are also some jaw-dropping special effects. I won’t spoil it for you, but there are a few scenes where gravity comes into play, and I’ve never seen anything quite like it. Again, I won’t spoil it for you because it’s better to have it as a surprise, but it’s very, very cool. 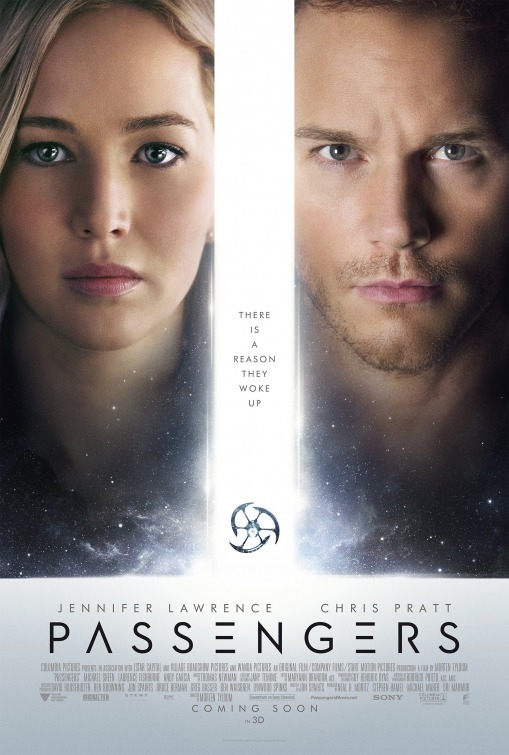 Honestly, other than a few hokey lines of dialogue at the very end, I have no complaints about Passengers. The performances were engaging, the special effects were top-notch, and the story proved incredibly complex, especially in terms of cause, effect, and morality. This entry was posted in Movie Reviews, Uncategorized and tagged arts, chris pratt, entertainment, jennifer lawrence, movies, passengers, reviews.